I've absolutely worn out the Brook Trout in the Smoky Mountains on two different occasions with my Kurenai HM30R. This little rod is an absolute thrill to fish with! 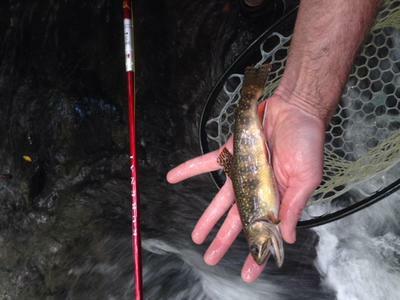 It will handle any Brook Trout in the Smoky Mountains and the Rainbows and Browns on the smaller waters. I wouldn't expect anyone to be disappointed with this rod. I have the Kurenai 63 (longest model) and absolutely love it. For still water fishing where little Browns and the occasional stocker rainbow lurk, there's no better rod. Nice fish too! I always say that I have two rods that immediately create a sense of wonder in folks when I let them handle them. One is the Nissin Air Stage Hakubai 240 (more of a micro-fishing pole) and the other is your Suntech Kurenai 30R. In fact, you must be extra careful when you loan them out because you may not get them back! Even non-anglers get a smile on their face and start casting them. Both are so well balanced and engineered that they cry out to be used. And if a person ever hooks a fish with one . . . well, they're absolutely smitten. I have the Kurenai 39. Over the past 6 years I've fished many different rods. Excepting the carp and micro rods, there are three that go with me everywhere, TB36, TB40 and my beloved Kurenai. For small to medium size fish action the Kurenai is an absolute delight. For small streams, the Kurenai gives the feeling that somehow my arm is simply 3 meters long! It is so balanced and so light! I normally fish it with a 2.5 or 3 level line. However several of the small streams I fish have 15-17 inch fish in them. There have been several times in the last 2 years that I have felt the adrenaline rush of my Kurenai 30 being maxed out! The mantra kept going over and over again in my head, "Coach says Chris underrates the ability of the rods he sells." No broken rod, and only one broken tippet so far on trout! My only other broken tippet was when I was pulling in a nice sunfish and a BIG bass thought it was an easy meal. It was no contest, tippet snapped immediately. I almost always fish 7x tippet. Broken rods are not fun. I am tempted to buy a longer Kurenai, but somehow, I always end up with a different rod. I am curious if the magic holds in the longer rods as well. I wish I had never mentioned that Coach said that. People do break rods. Some are on snags, some are on fish, some are clearly operator error some are cause by an assumption that the rods are stronger than they are. I think I'm going to start walking back Coach's statement. What I should do is search the site and remove it from any page it's on. The reality is that seiryu rods - like the Kurenai - were designed to catch fish that don't get over about 7" long. You're pretty safe with 7" fish. You're asking for trouble if there are 17" fish in the stream. I know of fish larger than that caught with a Kurenai. I also know of broken rods. Japanese tenkara rods were designed for anglers fishing in Japan. Most of the fish they catch are 8-9". You're pretty safe with 8-9" fish. Many of the rods are rated for 4X tippet. A 9" fish is not going to break the rod so the tippet rating doesn't really matter to the Japanese. Using 4X tippet in the US will break rods. There is a misconception (and I'm probably partially responsible for it) that the tippet will always break before the rod does. It won't. You can break a rod even if you never exceed the manufacturer's maximum rating. Les says he generally uses 7X tippet. I think that's wise. 7X is plenty strong enough to catch the fish the rod was designed to catch.